H&M Space Race | Light Your Nails! Oggi vi parlo di uno smalto H&M che ha messo in fermento le nail blogger di mezzo mondo appena scoperta la sua esistenza. H&M Space Race ha infatti invaso Instagram, e in tante lo hanno paragonato ai famosi smalti olografici Nfu-Oh. In effetti Space Race è un holo vecchia scuola, con un effetto olografico da far fermare il traffico, ma con una formulazione da mettersi le mani nei capelli se non si possiede una base apposita. Io l'ho steso sull'Aqua Base e non ho avuto problemi, ma non credo sia al livello di uno Nfu-Oh, anche se ci si avvicina. Today I'm showing you a nail polish by H&M that made the nail polish community crazy on Instagram as soon as it appeared there. Everyone seemed to compare it to Nfu-Oh holos. H&M Space Race is indeed an old school holo, one of those traffic stoppers ones with a super troublesome formula if you don't own an aqua base. I have one and had no problem applying it. I don't think it's on par with a Nfu-Oh though it's right behind there. La foto sfuocata è d'obbligo per far vedere l'effetto arcobaleno! Purtroppo H&M Space Race è uscito con una collezione stagionale circa un anno fa, però poi è stato riproposto in un cofanetto con altri due smalti, quindi niente ci vieta di sperare che entri di diritto nella gamma dei colori permanenti. Se passate da un negozio H&M col reparto beauty vale proprio la pena buttarci un occhio! Cosa ne pensate? Ne avevate già sentito parlare e magari l'avete già comprato? Out of focus pic to show you that rainbow! Unfortunately H&M Space Race was part of a Seasonal collection from last year, but it was re-released later on in a box with two more shades, so let's hope it will make it in the permanent range. For sure it's great having a look for it if you happen into an H&M store that has a beauty corner. What do you think of it? Had you heard about it already? It has a nice flash. Figurati :D Magari becchi ancora un cofanetto in saldo! Very pretty although not a good colour for my skin tone. I've not seen this shade before, actually! Silver usually looks bad on me, too, but when it's holo I just wear it! I am lucky enough that the store in my home has got the beauty corner, but lots of stores just don't carry the cosmetic line which is a shame. Wow, I love this! 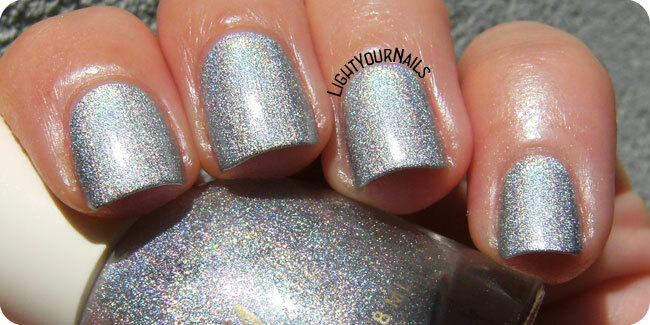 It's so nice to see holos enter the mainstream! Wow this polish looks great! Never tried H&M Polishes before, but they look better than I would have expected. I've only tried this one from the new series but I've heard amazing reviews of their cremes.